I have no idea how that speech played for TV audiences. I watched it in the space between the Nevada and the Tennessee delegate sections. Before the director of Changeling spoke, these folks craned their necks, watching the section on the far right (stage right) of the stage get chained off for … something. “It’s Clint Eastwood!” said one delegate. “No, I heard it’s hologram Elvis!” joked another. 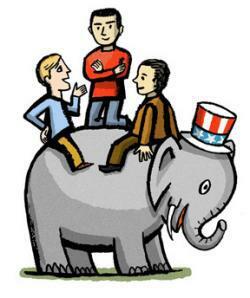 But the special sequestering was for Romney, not Eastwood. The actor emerged in front of a Man With No Name silhouette drawn across a generic sun-bleached landscape, and started muttering. And kept on muttering. You’ve been to weddings, right, where the best man starts getting too real, and less funny than he thinks, but everyone’s instinct is to root for him and try to find humor? That was what happened. 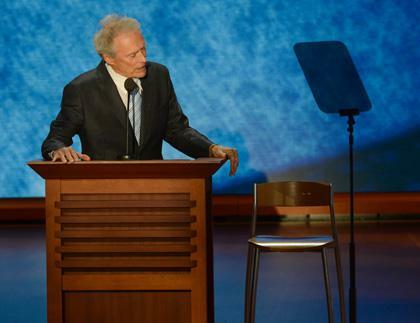 Clint Eastwood address a chair that he pretends has President Obama in it. Toni L. Sandys/The Washington Post for Getty Images. It might be a mistake to seek meaning from that speech, but Eastwood’s ramble came off like a slightly bored swing voter’s reasons for rejecting Obama. He was happy that Obama won, but then he realized that lots of people were unemployed. He didn’t understand why Obama surged in Afghanistan, when he could have said, “let’s leave today”—a position Mitt Romney does not even hold. I’m spinning this harder than Romney’s own campaign team, who stood in that ad hoc hallway and looked increasingly fed up as Eastwood kept talking. They must have realized that an epic moment was occurring, and in the Twitter track/viral/LOL media it would overshadow Romney. It certainly overshadowed him in this post! I thought Romney did just fine. Every delegate I talked to on the way out of the speech focused on his call-back to Barack Obama’s 2008 line “this was the moment when the oceans began to roll back.” It sounded pompous at the time; it sounds worse now. Delegates largely read this as a joke about Obama’s pretentiousness, not as some joke at the expense of global warming or doomed floodplain denizens.